Charles Layne sits on the Nashville MTA, riding the bus down Murfreesboro Pike, passing LaFayette Street to head onto 2nd Avenue South. The Trevecca senior is on his way to his internship at the Nashville Civic Design Center (NCDC). To get a better feel for his city, Layne takes the bus through parts that may be unfamiliar to some of his Trevecca classmates. “I think it’s really easy to get consolidated to our own silo of how we engage and participate in the city. Like, say you live in Mt. Juliet—your experience is so different from someone’s who lives in Nashville,” Layne said. “Breaking down those walls contributes to the conversations that we need to have. 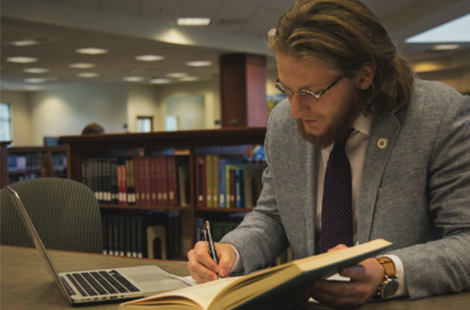 Layne, who will graduate in May, is studying community development and behavioral science at Trevecca. Knowing his home—and seeing all the angles he can—is just part of what informs his work with the NCDC’s Design Your Neighborhood initiative. And though he is a native of the Nashville area, Layne says his work with the design center has helped him see the city from a different point of view: through the eyes of the students in the initiative. The Design Your Neighborhood initiative encourages students to become active participants who engage with the built environment of their communities. The initiative aims to create positive change within Nashville’s communities. Melody Gibson, education director at the Nashville Civic Design Center, said the program strives to teach local students about community design. This year, they are talking about transportation and affordable housing. Six factors affect the built environment, Gibson says: neighborhood identity, transportation, walkability, food resources, buildings and parks, and open spaces. Layne is working with the NCDC team, along with Vanderbilt Peabody College, to research the impact the Design Your Neighborhood initiative has on the students involved. Students in the program take surveys before, during and after the program. Designed to gauge the students’ awareness of neighborhood, the surveys also measure their knowledge of how community design can solve problems and how empowered the middle and high school students feel to create change in their neighborhoods. Empowering students to make a difference in their own communities is something that excites Layne. Layne sees the Design Your Neighborhood initiative as an avenue to create space for the voices of Nashville’s students when it comes to the city’s development and growth. Layne will graduate in May with his degree in both community development and behavioral science. He’s excited and hopeful for what’s next. “I’ve been accepted as a candidate for the master’s degree program in city and regional planning program at the University of Memphis, and I’m waiting to hear from the City of Memphis regarding my application for a housing and community development fellowship that would allow me to work with a local nonprofit agency on the development of innovative urban education solutions,” he said.